Pesto is a great go-to, no-cook sauce when you are pressed for time. Traditionally, people think of herbs, like basil, when they think of pesto. However, there are so many variations on this easy, healthy sauce. For my all my pesto recipes, I stick to the formula of greens + garlic + nuts + extra virgin olive oil + extras. For this recipe, I choose kale as the greens, pistachios as the nuts and lemon juice as the extra. The resulting combo is bold and nutty with a delightful citrus finish. 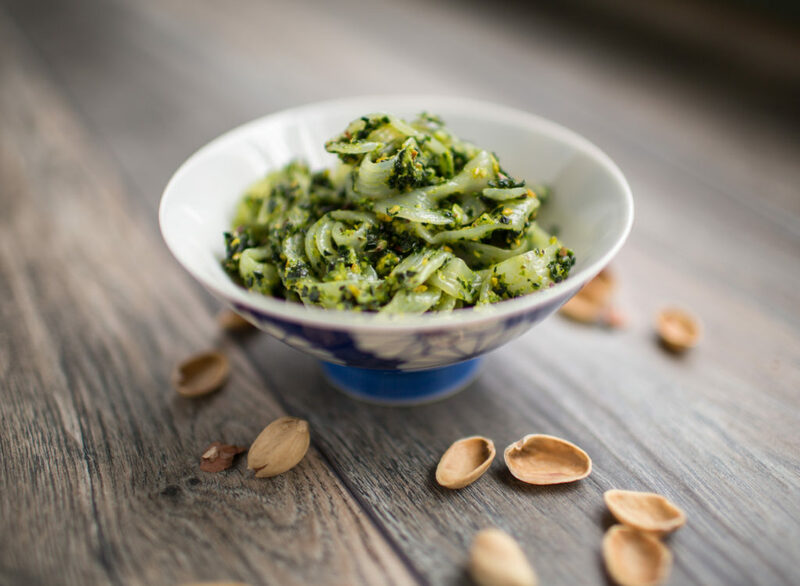 I serve this pesto over special gluten-free noodles made with Konjac, a food common in many Asian countries. But, this pesto would be delicious for traditional pasta or spiralized vegetables, as well as chicken, or even fish. In a food processor, add kale, garlic, pistachios and lemon juice. Add a pinch of salt and pepper; put on the lid and start the food processor. When the mixture appears well incorporated, turn off the food processor and pour the pesto into a medium-sized bowl. Use immediately on pasta, fish or chicken.